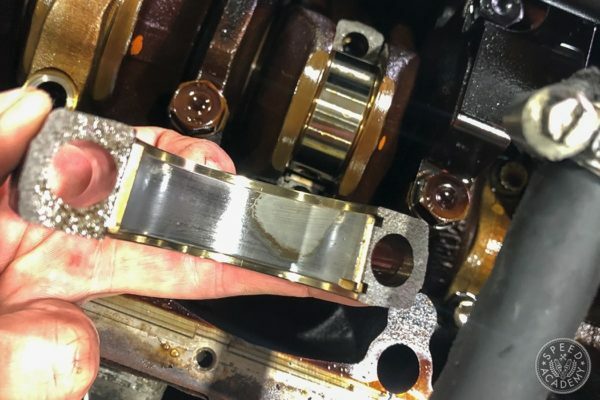 Fluid transfer in high performance engines is a vital function to ensure proper fueling, lubrication and cooling. 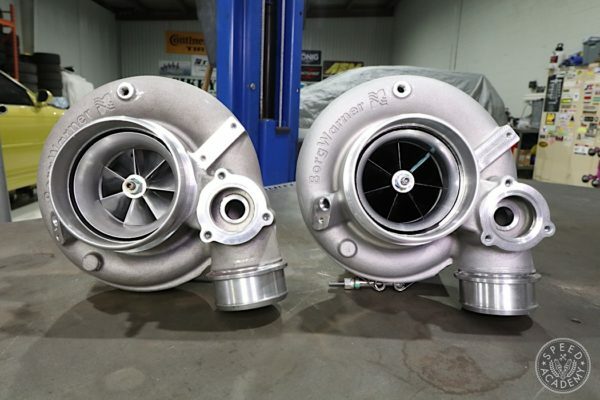 With these Motorsports applications seeing higher operating pressures and flow rates, conventional connection methods may not suffice. 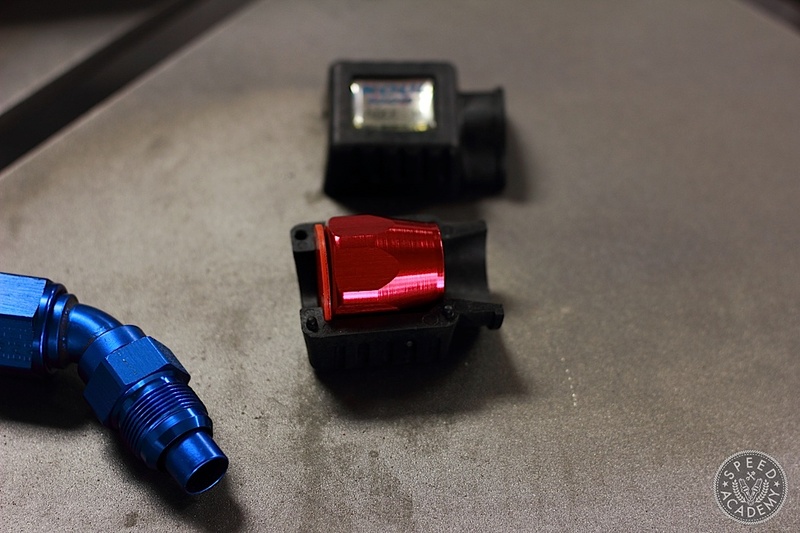 To ensure reliable and secure connections AN-fittings have been adapted from their military purpose to Motorsports applications. AN (Army & Navy) fittings pass a joint standard between these two military branches. If it can perform under warfare conditions, then it should be good enough for our applications. People may be turned off by AN fittings thinking that it is complicated to assemble, I was one of them. However, after assembling my first AN hose, it is relatively simple. 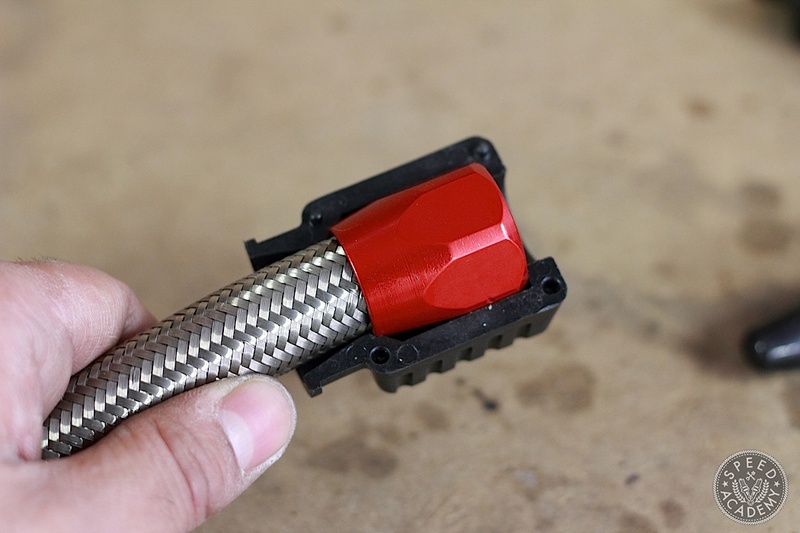 Here are simple steps to assemble your own AN hose for your application. 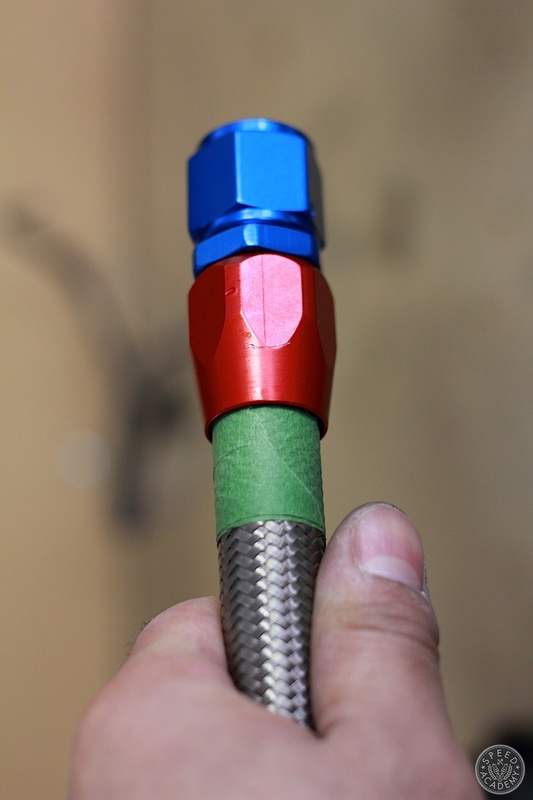 For our application we will use AN-fitting hose ends. They consist of 2 parts; a male and female fitting. Obviously you will also need hose. 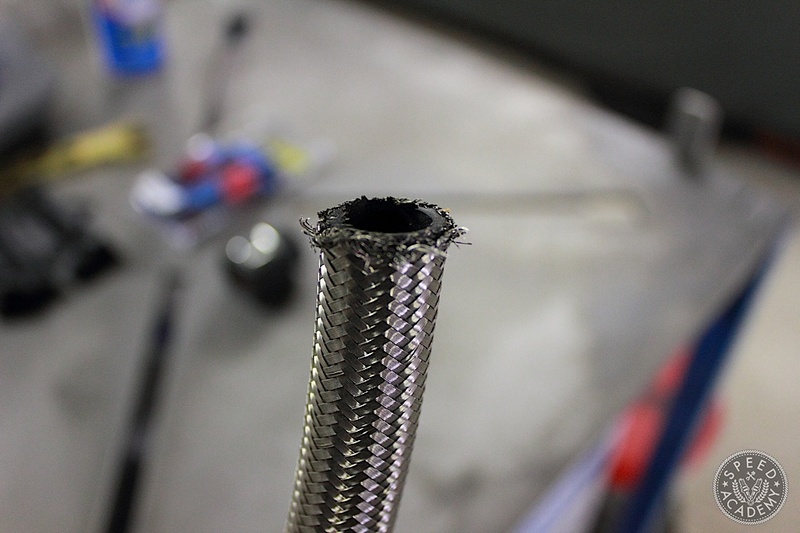 For our application we are using Vibrant Performance Stainless Steel braided -10AN hose. 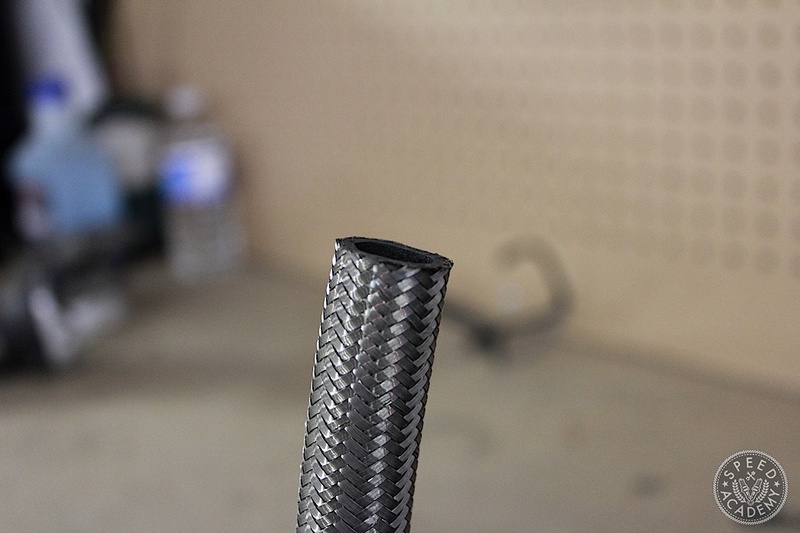 Once you have marked the required length(s) to be cut, I find that wrapping the end with electrical tape before cutting it decreases the fraying of SS braided hose. 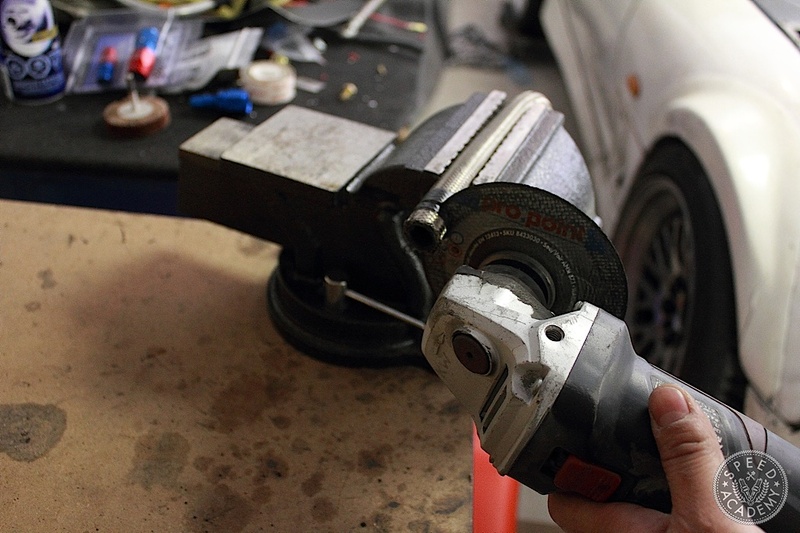 There are various ways of cutting SS braided hose, some people use cutters, hack saws or cut off wheels. I found success with an angle grinder with a metal cut off wheel as it seems to have less fraying. 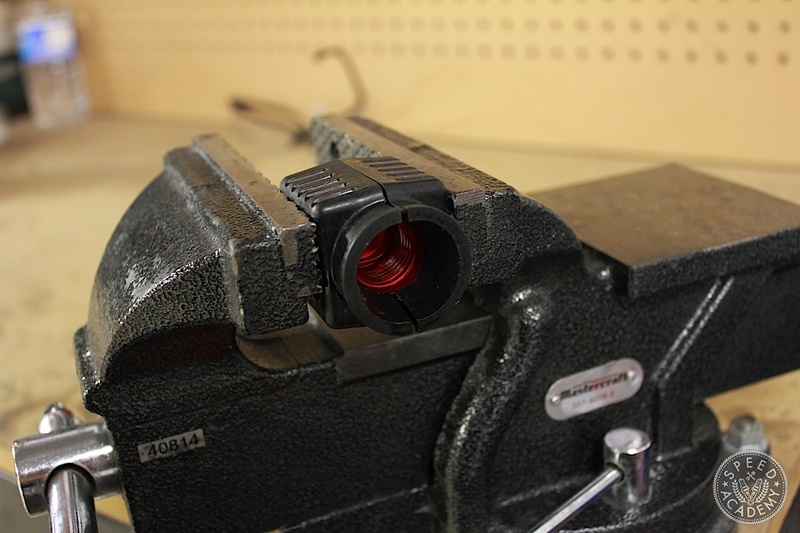 Do not forget your eye and ear protection if you are using any sort of cutting power tool. If you are lucky then you will end up with a hose end like this. Make sure the hose is level around its diameter to ensure an even mating surface with the inner lip of the female AN fitting. If God hates you then you’ll end up with a frayed end like this. This can also result when reusing a hose that had previously been fitted with an AN fitting. Anyone that has assembled SS braided hose will tell you that they would rather stand on Lego pieces and mouse traps than deal with frayed ends. The individual strands will stab you repeatedly until you and the hose are covered in blood. In extreme cases, it is best to cut the end off and start over. If you are only assembling a hose or two then it may not bother you that much. In my case I was assembling multiple stainless steel braided hoses for the fuel, oil and cooling system. Having endured some stray SS strands despite my best attempts with a clean cut I was ready to quit. Luckily I stumbled onto the “Koul Tool”. If you are using nylon braided hose then you will be fine without this tool. The tool itself is made from durable plastic composite that is virtually indestructible. The kits range from -4AN to -16AN. It has spacers to accommodate most popular AN fitting brands. You simply put the AN hose end into the tool and use the spacer if needed and close the tool. You can see the bottom opening that has a tapered opening to funnel the hose into the AN fitting. 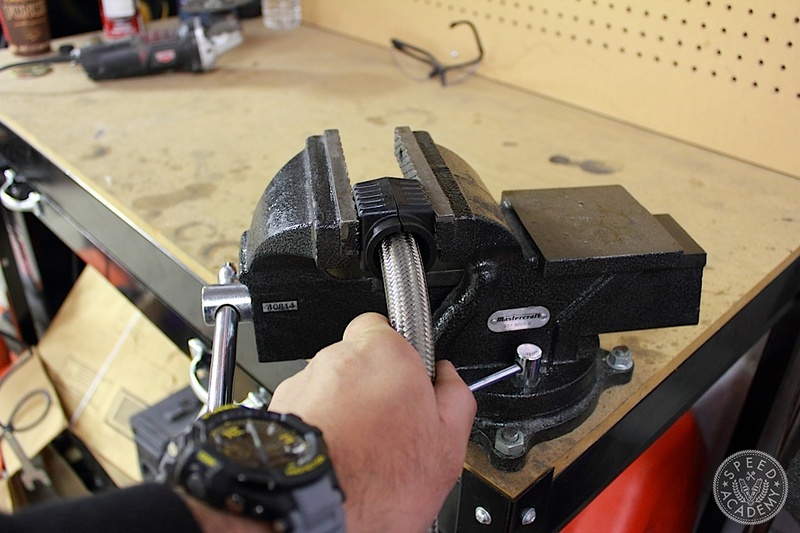 Set the tool in a vice and tighten until it is secure. 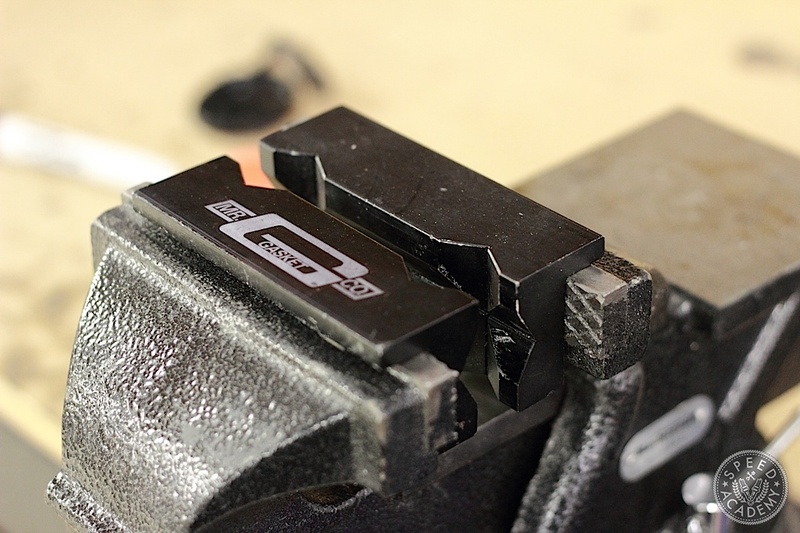 The tough plastic can tolerate the pressure from the vice but use common sense and don’t over clamp it as it can and will crack. 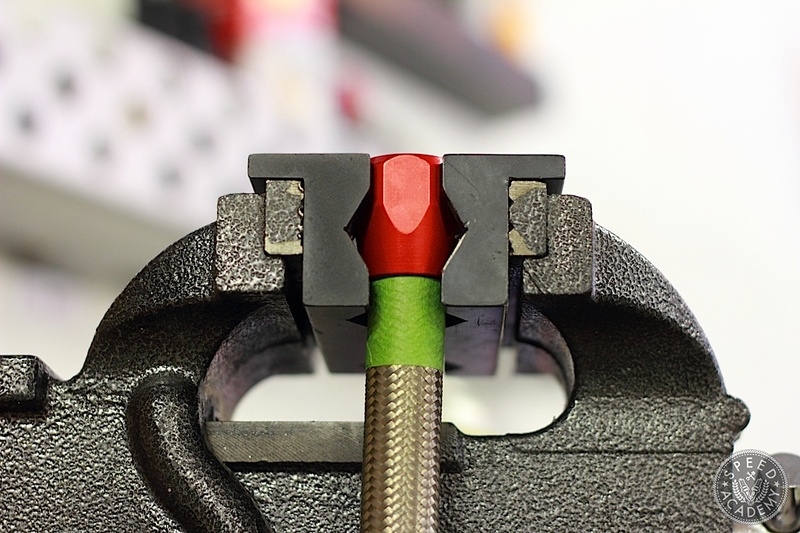 With the tool secure in the vice, take your AN hose and push it into the fitting by turning it clockwise while applying forward pressure towards the fitting. The hose should stop at the inside lip of the fitting before the treaded section like so. 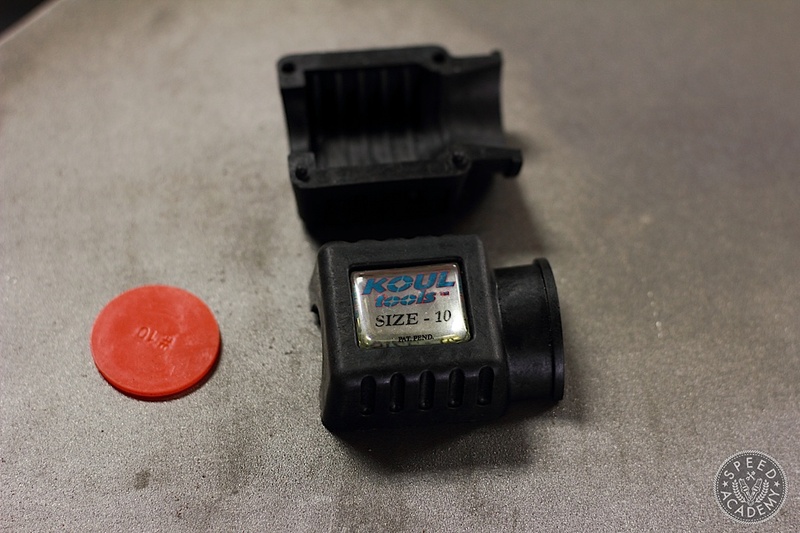 This is what your newly inserted SS hose looks like when the Koul tool is removed, clean and free of blood. 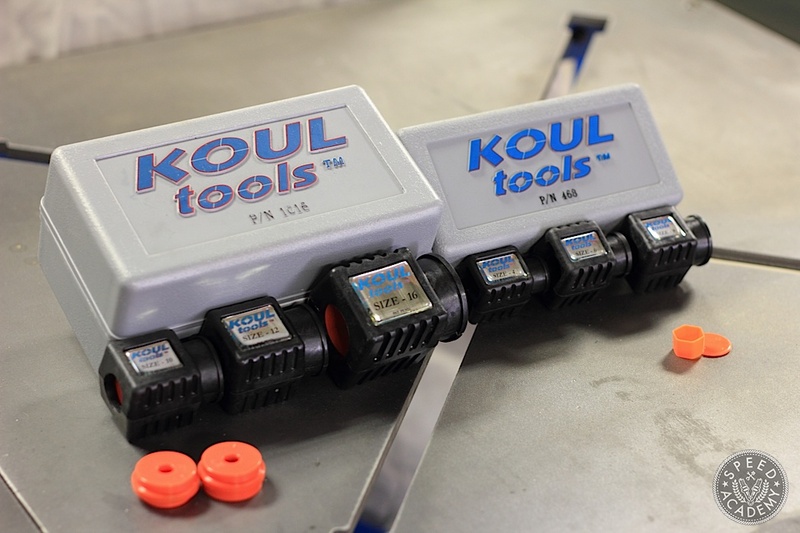 Of course you don’t have to get this tool but if you are going to be assembling various fluid transfer system hoses like I was, then it is an excellent addition to your tool arsenal. 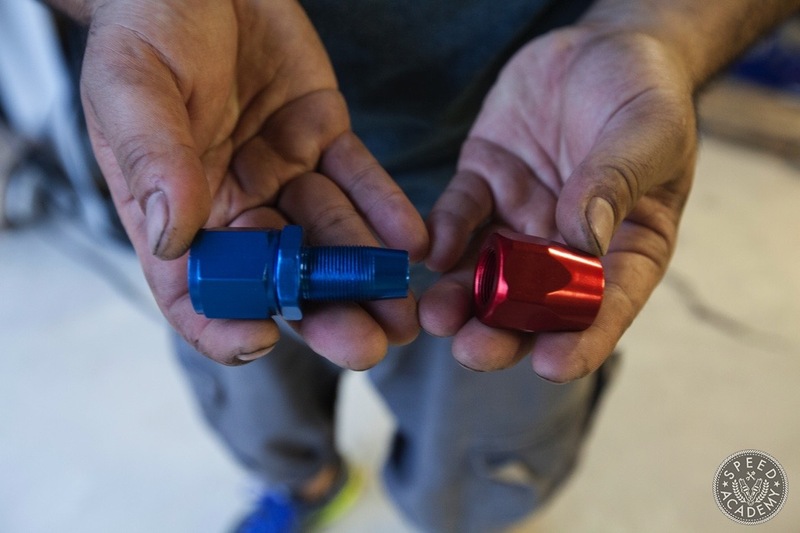 Speaking of having the right tools, we picked up these aluminum vice inserts to hold the AN fitting and hose in place while installing the AN hose end. The aluminum insert has angled provisions to hold the AN fittings in place without galling or damaging them. They have magnetized inserts to hold them in the vise. 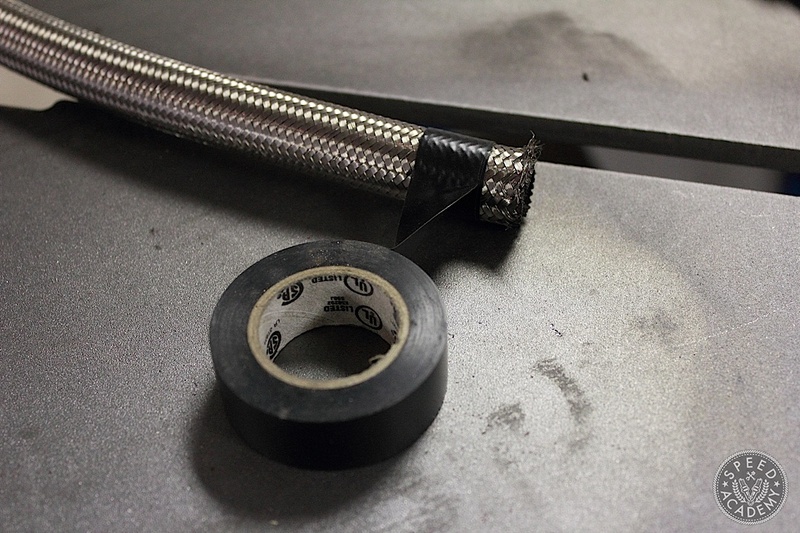 Here’s a pro tip, wrap tape on the hose and make sure the straight edge of the tape is right against the AN fitting. The purpose of this is to see if the hose gets pushed down and away from the inside lip of the fitting when installing the male hose end. This is the male AN hose end in question. As the fitting is screwed onto the female AN section, there is a possibility that the inner rubber hose will get pushed away inner lip of the female AN fitting causing leaks. The tape gives you a visual indicator if this has happened. 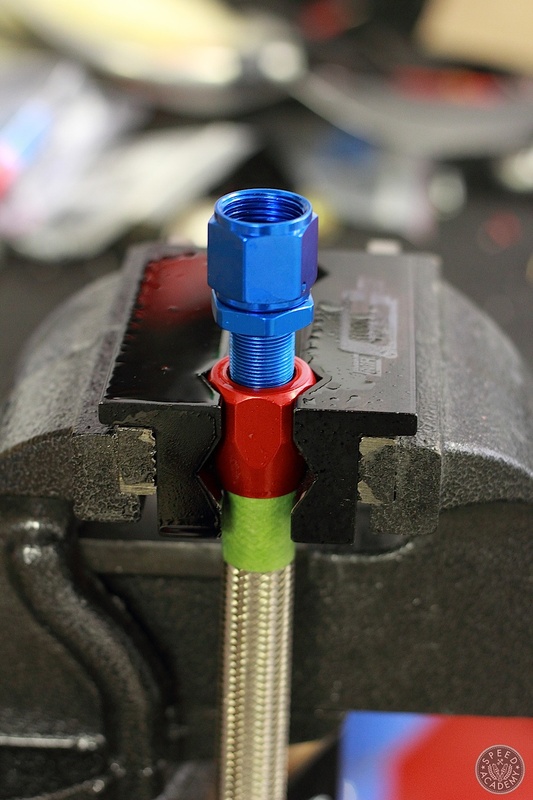 Spraying WD40 or silicone spray before screwing in the fitting helps the male end slip into the hose easier. 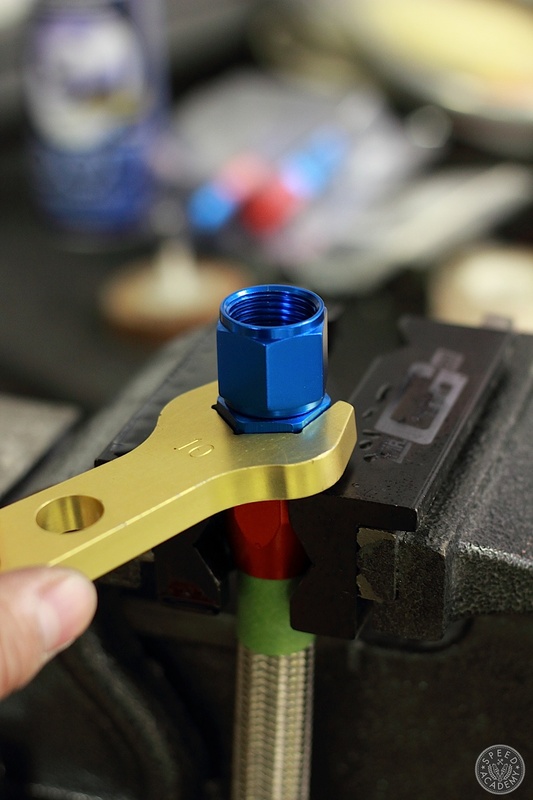 Using an AN wrench or equivalent wrench, tighten the fitting into the hose end. 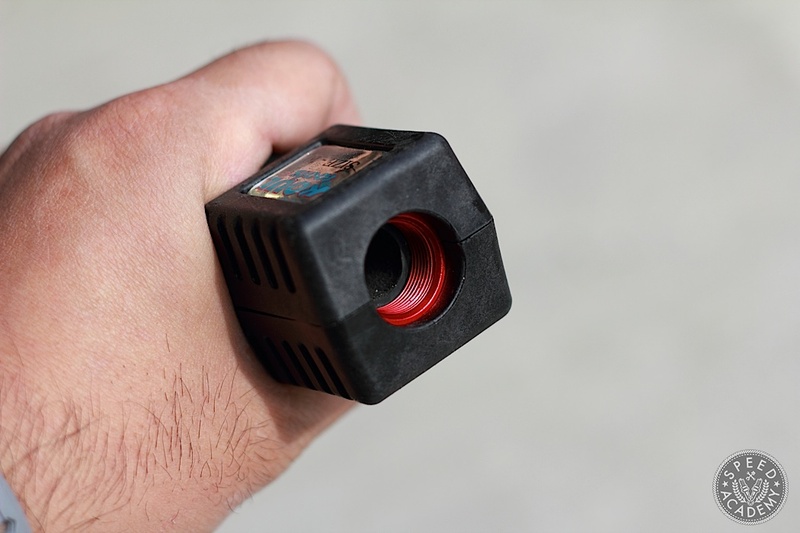 Applying an upward pushing motion on the hose simultaneously as you tighten the fitting into the hose also helps to combat the tendency of the hose to be pushed down. Voila! Here is the finished product. As you can see the tape remains tight against the lower fitting. If a large space develops between the tape and fitting then you will have to remove the male fitting and redo the process again until you achieve this result. But wait there’s more! Make sure that your assembled hose is clean and free of debris. 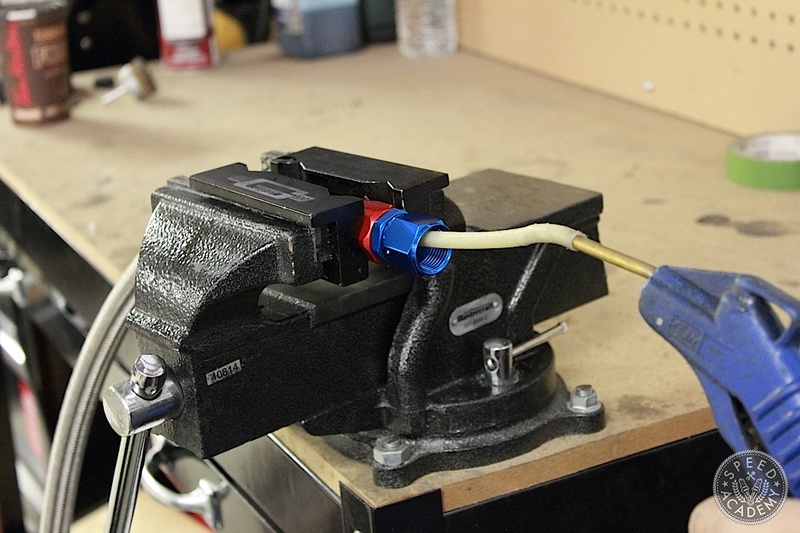 I found the combination of pressurized air and brake cleaner produced great results. You definitely would not want any of this to make its way into your fuel, cooling or lubrication systems and cause preventable damage. 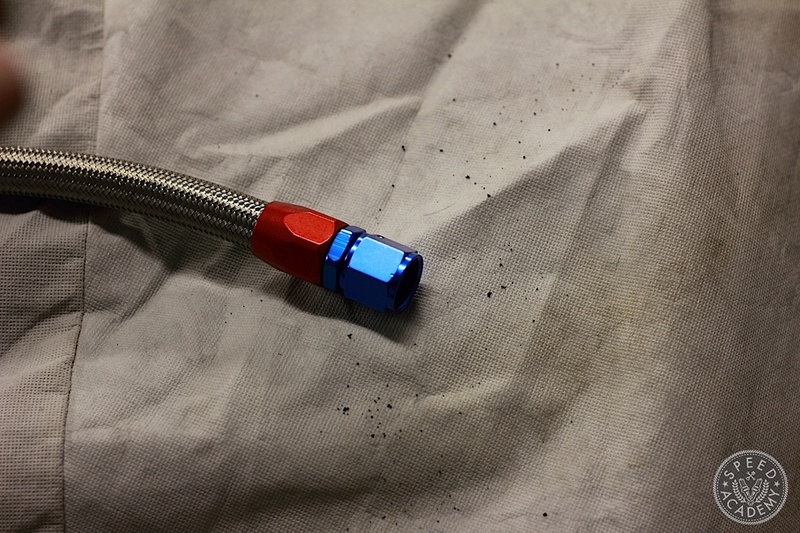 I recommend taping up the ends of your assembled hoses after you have cleaned them until you are ready to assemble your cooling, fuel or oiling systems. After that, welcome to the world of reliable leak free fluid transfer! 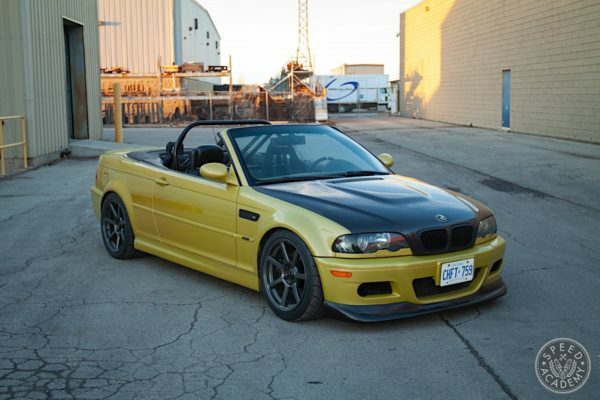 We show you how easy it can be"
We just shot some video using this method for the ITB install on the S2000. 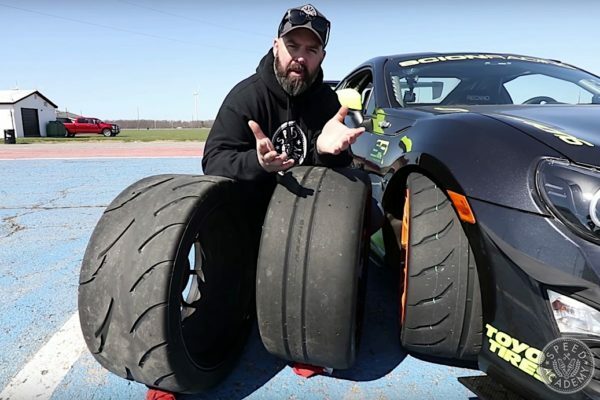 That video should be on our YT channel in a couple weeks. Thanks, we’ll try to shoot a video shortly!